I was born and raised in Portugal and though I had lived there until I was four I found myself, sixteen years later, exploring the country and Lisbon as a tourist. When I was four my parents bravely decided to leave everything behind and head to London. After another two years, and the birth of my sister, my parents decided to leave the city and move into the unknown lands of Essex. I grew up there and even my earliest memories reside there. Every year we would visit my grandmother and her partner, my cousins and aunts and uncles and visit the sunny beaches until we would be red from the suns heat. I visited Lisbon once when I was younger and my earliest memory of that adventure was getting caught between the Metro’s doors and gasping for air as my mother and grandmother wrenched the doors apart forcefully. As time went on we would visit Portugal less and when I reached the age of twenty my parents chose to move back to their home; Portugal. I stood at the airport with my partner, waving them goodbye as they disappeared up the escalator. Six months later in April, I visited the family once more with my partner. Since it was my partners first time in Portugal, and myself being an-almost-English-man, we took on sightseeing and travelled around with the family. On our first day, Saturday, we stopped off at Fátima in Portugal’s central region and visited the meticulous churches and joined in burning candles for loved ones. The sun was high above us as we walked around, spotting people crawling on their knees in debt to Lady Mary. 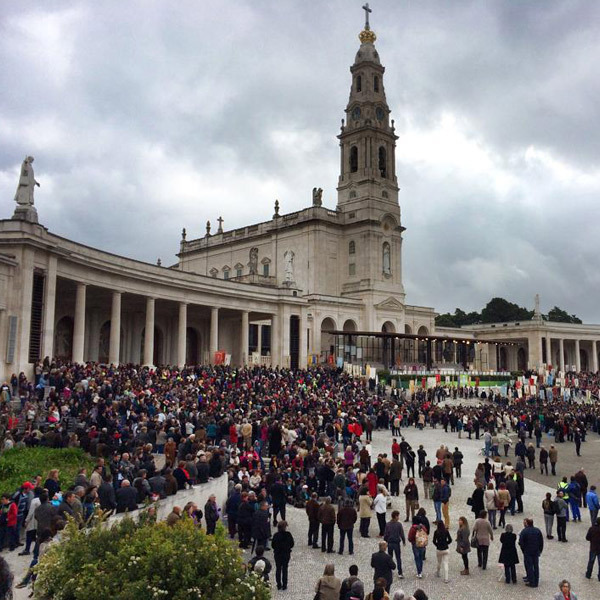 Fatima, crowded on a Sunday morning. Our next stop was Batalha Monastery, an incredibly gothic church that stands in Leiria district. We explored the church inside and found incredible architecture and even the tombs of John I of Portugal and his voice Phillipa, Henry the Navigator and more of the family. The last place we visited before going home was the beach home to the world’s largest surf-able wave at Nazaré. We stood at the top of a cliff, observing the beach and tiny ant-like people below us. People shouted at their stalls selling nuts and sweets or even little souvenirs. The beach is known as a tourist spot for surfers but for now, it was still quiet awaiting the summer sunshine and the rush of European tourists. Lisbon was our last destination to visit, and the one I was most excited to see. The bus had dropped us off at Campo Grande, a large bus station. Immediately we started for the Metro and jumped onto the first train on the Yellow Line to start our list of ‘things to see’. 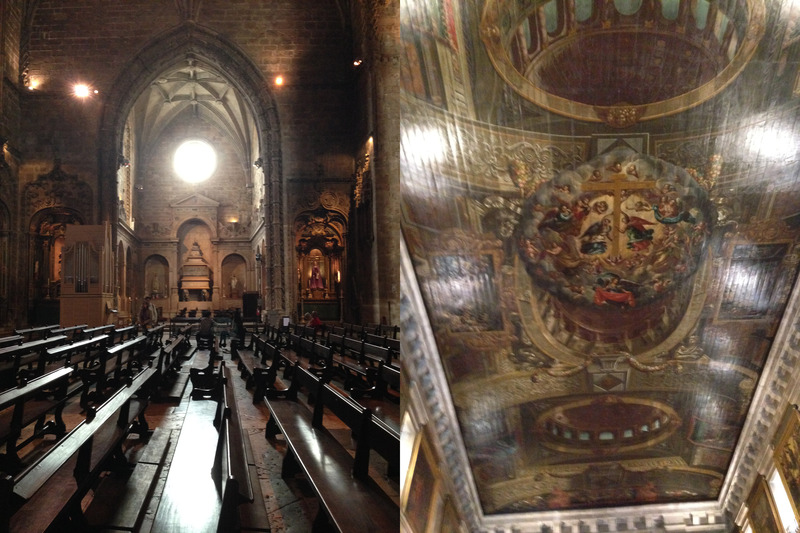 The first ‘thing to see’ was the Igreja de São Roque (Church of Saint Roch), Portugal’s most expensive church. The church was heavily decorated with paintings on the ceiling and walls to statues of Lady Mary hidden behind golden gates. We took a trip on the trams to the Bélem Tower. It was a tall, square tower that sat over the Tagus River made of limestone. We left the tower quickly and moved to the Jerónimos Monastery. Both the Tower of Bélem and the Monastery were Gothic Manueline styled, resulting in the architecture and decorations being bold and edgy. From left to right: Jerónimos Monastery and Igreja de São Roque. We explored the shopping centres and walked along the riverside taking photos of Europe’s longest bridge named Vasco de Gama. We left Bairro Alto and as Lisbon was known for its night-life we made sure to stop off at bars for a drink before moving on. We dined at a small restaurant located on a hill as a warm wind gently wove by us. It there we even saw a Portuguese celebrity having a meal with his family. After dinner, we walked continually and stumbled onto a gay bar as music erupted from the speakers playing Belgium band, Vaya Con Dios’ album Night Owls. We drank and indulged in friendly conversation with the barman as he, sadly, informed us of the death of his puppy three days prior to our visit. After an emotional conversation we left the bar and travelled the Metro back to Campo Grande in a rush to find the last bus home, after-all, it was no London.